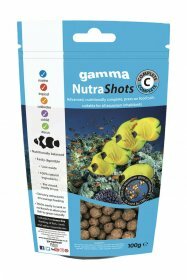 Gamma NutraShots are pre-mixed, ready to use food doses designed to enrich the animals environment and stimulate natural grazing and feed responses. 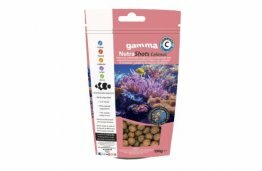 Sticks easily to the side of the aquarium or rock work, allowing your fish to graze whilst giving you a close up view of your fish feeding. 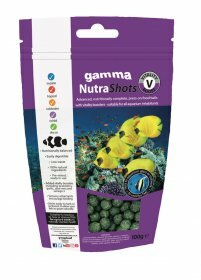 Nutritionally balanced and made from 100%natural ingredients including mussel, krill, prawn, fish, kelp, spirulina algae, aloe vera, omega 3, red and green nori, pro-biotic yeasts and garlic. 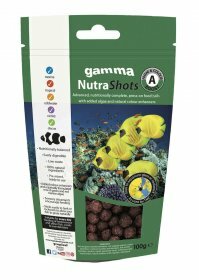 Also includes aquaculture based sensory attractants to encourage feeding. As the food is eaten by fish, fine particles will be released into the aquarium, providing food for small fish, corals and other filter feeders.